We have a problem here, folks. 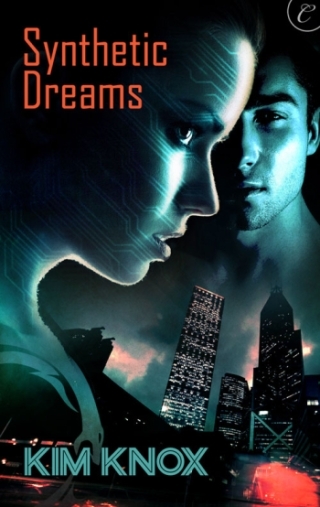 As you can see, I have a cover exclusive for SYNTHETIC DREAMS (Carina Press, February 27, 2012), a forthcoming cyberpunk romance by Kim Knox. Right now, you can only find this cover image here at The Galaxy Express. With no past to turn to and no hope for the future, Vyn Somerton does what she always has: she survives on her skills, hidden away from the prying eyes of the Corporation. Until now. Vyn has created the ultimate in illegal gear, simulacrum, the perfect virtual lie. It's untraceable, untouchable, and until recently, impossible to create. She has plans to make herself rich beyond her wildest dreams…that is, until the Corporation turns her life upside down. Again. Paul Cross is a part of that upheaval. Catalyst. Corporate Mercenary. Incredible and forbidden. He’s been watching Vyn, knowing that she’s the key to finding and rescuing his brother, a brother the Corporation he works for has replaced with a stranger. She’s a means to an end. But watching her, moving though her life, he finds his thoughts becoming unexpectedly…carnal. With their enemies closing in, Vyn’s life is in chaos. Can she trust Paul or is he the key to the destruction of all her worlds? Well, no problem there that I can see. As it should be, cyberpunk romance is seriously catching on in science fiction romance. Plus, the story features a smart heroine with a unique occupation. Let’s take another look at the cover, shall we? Take note of the circuitry adorning the heroine’s face. Yes, it’s clear, unapologetic cover code that readers can expect a cyberpunk romance. The Carina team added a little something extra to the stock image. The circuitry informs us that a fresh new dish has been delivered to the romance buffet. Therein lies the problem: Carina Press just raised the ante as far as ebook covers are concerned. They demonstrated that if they so choose, a digital-first publisher can go that extra mile to show science fiction romance fans that they care about their reading needs. I mean, how the heck am I supposed to whine and complain about getting more quality, customized SFR covers when one like SYNTHETIC DREAMS comes along? What kind of meaty discussions about cover identity crises can I have on this blog when publishers are like, “Hey, we’re listening to you" and "We get what readers seek in sci-fi romance covers," right? At any rate, my tongue-in-cheek shenanigans aside, enjoy this cover!